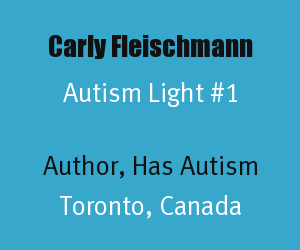 Autism Light #1 is Carly Fleischmann. Carly Fleischmann is a teenage girl with autism who after years of being unable to communicate with the world is utilizing her computer keyboard to write and communicate with the world. Carly Fleischmann is from Toronto, Ontario, Canada and now that she has her voice is an effective proponent of autism awareness. Carly Fleischmann is an Autism Light for the way her assisted communication is opening a window into the thoughts of nonverbal people with autism. At the age of two, Carly Fleischmann was diagnosed with severe autism and an oral motor condition that prevented her from speaking. Doctors predicted that she would never intellectually develop beyond the abilities of a small child. Although she made some progress after years of intensive behavioral and communication therapy, Carly remained largely unreachable. Then, at the age of ten, she had a breakthrough. While working with her devoted therapists Howie and Barb, Carly reached over to their laptop and typed in "HELP TEETH HURT," much to everyone's astonishment. This was the beginning of Carly's journey toward self-realization (Source). Awards: In June, 2008 she won the Multi-Cultural Achievement Award from MBC Global. Carly's Voice: Carly Fleishchmann and her father Arthur Fleischmann co-authored the book Carly's Voice. It was published in April, 2012. The book may be ordered fromSimon & Schuster and you can read excerpts at Carly's website at http://www.carlysvoice.com/. The following is a video trailer for the book. 20/20: This 20/20 news story from YouTube shows that Carly has a lot to say and also shows some snapshots of how professionals and parents interacted with her during this amazing breakthrough. The Talk: Carly Fleischmann was interviewed by Holly Robinson Peete at The Talk in 2011. Holly Robinson Peete is Autism Light #100. Holly Robinson Peete has said, "Carly is--for me--autism's fiercest and most valuable advocate". Other Articles: Here are some other news articles on Carly Fleischmann. 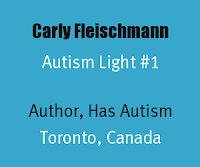 Special thanks to Carly Fleischmann for being an Autism Light. It is her renaissance as a young lady with autism that inspired the beginning of the Autism Light blog series back on June 22, 2011. There might never have been an Autism Light blog if it wasn't for her story touching the blogger and autism father who created Autism Light. Here's wishing the best for Carly Fleischmann. Something tells us we'll be hearing a lot more from her in the future. Autism Light honors diverse heroes to the world of autism. Photos: The photos in this post were used with permission of Jessica Roth of Simon and Schuster.